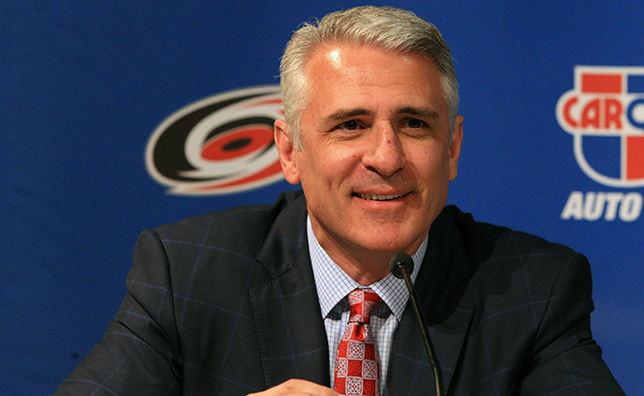 RALEIGH, NC – Peter Karmanos, Chief Executive Officer, Owner and Governor of the National Hockey League’s Carolina Hurricanes, today announced that the team has promoted Ron Francis to Executive Vice President and General Manager. In addition, Brian Tatum will now serve as Assistant General Manager, and the team has hired Mike Vellucci as Assistant General Manager and Director of Hockey Operations. Jim Rutherford will remain with the team as President, in an advisory role. “Based on Jim’s decision to step down as GM, now is a good time to go in a new direction,” said Karmanos. “Ron has dedicated himself to learning all aspects of running a hockey team in the past eight years, working in player development, on the coaching staff and in hockey operations. He has proven that he has the work ethic and passion to get the Hurricanes back into the Stanley Cup Playoffs. As the eighth general manager in franchise history, Francis, 51, will be responsible for all hockey decisions for the Hurricanes. The Sault Ste. Marie, Ont., native is entering his ninth season in management with Carolina, the last two of which were as Vice President of Hockey Operations. After the conclusion of his playing career, Francis first re-joined the team in November 2006 as director of player development. He was promoted to assistant general manager on Oct. 4, 2007, but returned to the team’s locker room on Dec. 3, 2008, when he went behind the bench as associate head coach. He returned to the front office full-time in June 2011, accepting the role of director of hockey operations. A member of the Hockey Hall of Fame, Francis scored 549 goals and earned 1,249 assists (1,798 points) as a player, ranking fourth all-time on the league’s scoring list behind Wayne Gretzky, Mark Messier and Gordie Howe. His 1,249 assists rank second only to Gretzky (1,963), and he ranks third on the games-played list behind Howe (1,767) and Messier (1,756). Vellucci, 47, joins the Hurricanes after 14 seasons with the Ontario Hockey League’s Plymouth Whalers, serving as Head Coach and General Manager for the majority of that time. As Assistant General Manager and Director of Hockey Operations, Vellucci will oversee scouting and player development for the Hurricanes. The Farmington, MI, native led Plymouth to a 468-322-36 record during his time in the OHL, and he was the first American to win the Matt Leyden Trophy as OHL coach of the year after the Whalers captured the OHL championship in 2006-07. He was also named the OHL’s Coach of the Year and Executive of the Year in 2012-13. Prior to joining the Whalers, Vellucci was with Detroit Compuware of the North American Hockey League (NAHL), where his teams went 241-82-27 in the regular season from 1994-99, and captured U.S. national championships in 1994 and 1999. The Ambassadors also captured two NAHL regular-season titles and four Robertson Cups. Vellucci played professionally in the IHL, AHL, ECHL and BHL from 1986-89. Selected by the Hartford Whalers in the seventh round of the 1987 NHL Entry Draft, Vellucci played for Hartford during the 1987-88 season. Tatum, 40, is entering his 17th season with the Hurricanes. As assistant general manager, the Raleigh native’s responsibilities will include staff contract negotiations, scheduling, serving as the club’s liason to the NHL regarding matters related to the Collective Bargaining Agreement and all day-to-day hockey operations administrative duties. Tatum has served as vice president of team operations since 2012, after working as director of team operations for the previous five seasons. He was the Hurricanes’ team services manager from 2000-2006, after working in ticket sales for the club. A graduate of Broughton High School, Tatum attended UNC-Wilmington, where he was an infielder on the Seahawks baseball team. He received a master’s degree in sports management from North Carolina State University in 1997.